This represents the strongest signal yet of establishing a fully functioning spot market trading mechanism, an indicator of true marketization of the power sector. However, attaching participation in the spot market with signing a long term power purchase contract may present an obstacle to renewable generators looking to participate. Heavy curtailment and decreasing utilization hours for wind is becoming evident in dampening investor enthusiasm. National wind utilization hours declined overall by 5% from last year to 1251 hours for the same period. However certain provinces have seen large reductions in operating hours, with Xinjiang seeing a decrease of 29% to 946 hours, Ningxia falling 25% to 1064 hours and Gansu decreasing 9% to 870 hours. 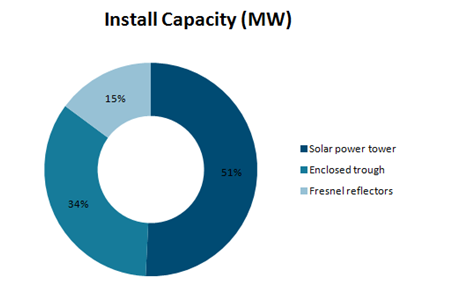 While a reduction in the feed-in tariff for renewables was expected, the nearly one-third cut for utility-scale solar projects means this reduction will likely lead to further consolidation in the local PV markets. Azure consulting may be able to help navigate the pricing policy landscape in China. 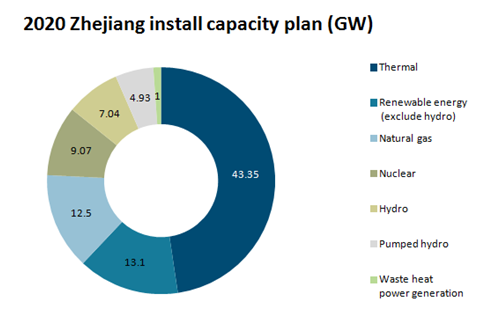 The decreasing installations of new thermal capacity forecasted in Zhejiang's 13th Five Year Plan promotes an increased share of renewables in the province, as the percentage of installed renewable capacity is expected to rise from 40% in 2015 to nearly 50% in 2020. Tower-based concentrated solar is the top CSP project to date, mostly because it has a higher startup and construction cost. We expect the other methods to be better suited to smaller scale installations. Chinese companies are expanding their control of international companies to increase revenue streams. The 23.6% minority ownership stake gives State Grid an inroad strategy to Brazil, South America's largest economy and a top transmission and distribution grid market. CPFL Energia owns 13% of the total distribution market share and manage over 1.6 GW of generating capacity. The weakening Brazilian economy is opening up foreign direct investment opportunities for investors, and China is leading the pack with $4 billion USD year to date. The downturn also is scaring away existing investors, such as Duke Energy, which is selling its Latin America energy assets and has invited China Three Gorges, State Grid, and Brookfield Asset Management to purchase its assets. Presumably, a change from centralized to local control of offshore wind approval should make things more efficient, however, data and analysis from the 2013 Carbon Trust Offshore Wind Report point to a slowdown. Offshore wind projects as of 2013 took around two years to approve. Local governments are less well-equipped to assess wind projects, compared to provincial-level approval processes.